This page covers basics of lens antenna.It mentions functions and operation of lens antenna. It describes lens antenna types viz. dielectric lens antenna and metal plate lens antenna. Definition: The lens antenna is 3-dimensional electro-magnetic device which has refractive index other than unity. It consists of electro-magnetic lens along with feed. This antenna is similar to glass lens used in optical domain. • It generates plane wavefront from spherical. • It forms incoming wavefront at its focus. • It generates directional characteristics. • It is used to collimate electromagnetic rays. • It controls aperture illumination. The figure-1 depicts working operation of lens antenna. As shown, feed antenna is used at the focal point of lens. The two different modes of lens antenna are shown viz. transmit mode and receive mode. As shown in the transmit mode, diverging rays are collimated which forms plane wavefront after they are incident on the lens and have come out of it. Collimation occurs due to refraction mechanism. It occurs in the lens with refractive index of less than one. As shown in the receive mode, parallel rays converge at focal point after they have passed through lens due to refraction mechanism. 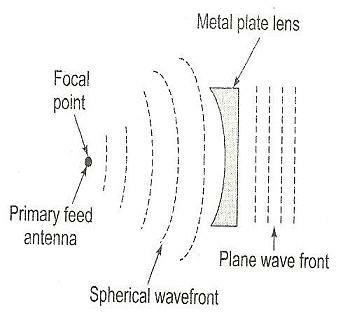 Lens antenna is used along with point source, but practically horn antennas are used at focal point. There are two types of lens antenna. The figure-2 depicts dielectric lens antenna. 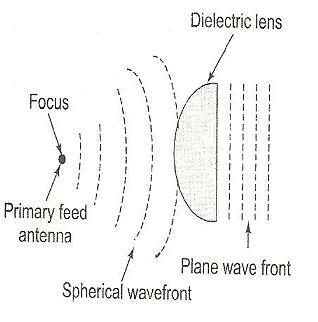 As shown spherical wavefront produced by primary feed antenna is converted into plane wavefront by dielectric lens. It is also known as delay lens antenna due to the fact that outgoing EM rays are collimated & delayed by lens material. • It is useful at higher frequencies, it becomes heavy and bulky at frequencies less than 3 GHz. • It is made of polystyrene or lucite & polyethylene. The above mentioned limitation of frequency is avoided by stepped or zoned type of dielectric lens. The width of stepped lens is expressed as follows. The bandwidth of zoned lens antenna is expressed as follows. The figure-3 depicts metal plate lens antenna. In this type of lens antenna, spherical wavefront is converted into plane wavefront but here outgoing wavefront is speeded up by material of lens. The same operation is shown in the figure. The main advantage of lens antenna is that feed antennas in the design do not obstruct the aperture. The disadvantage of lens antennas is that they are costlier for same gain/bandwidth in comparison to reflector antenna.